Approximately 70 percent of enrolled graduate students live in campus housing and are a part of our residential life community. The Graduate Student Life team and Community Associates seek to enhance the residential experience by helping to foster a sense of community through a variety programs and activities. The office works closely with the Lakeside, Graduate College House and Lawrence Committees to provide programs and create opportunities for graduate interaction across disciplines. The office also offers assistance with residential and apartment life matters and exceptions to graduate housing and campus dining policies. The Graduate Housing Office provides detailed information on entering the housing system, apartment life for graduate students, the graduate college, floor plans, move in information, room draw information and much more. Students are urged to explore the Graduate Housing website and contact the graduate housing staff with any questions. 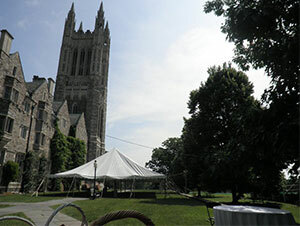 Princeton makes every effort to make an offer of University housing to all incoming graduate students whose applications for University housing meet the announced deadline. After all eligible first-year students have been housed, priority decreases with year of study. Most students can expect to be housed for three years. Enrolled students who need to remain in University housing for special personal or financial reasons may receive priority over other returning students if they apply for hardship housing. Information can be found in the housing room draw guide. Additional information is given in the on the Graduate Housing and Cost of Living website.